India has crossed the 100million mark in terms of the number of Internet users in the country. As of September, 2011 there were 112million Internet users in the country, a growth of 13 per cent compared to last year. Also, this number can reach the 121million mark by December, 2011, according to IAMAI. Out of the 112million Internet users, majority were from urban areas (88million) while the rural areas had a minor share of Internet users (24million). But a thing to note is that smaller towns completely dominated the top 8 metros in terms of combined Internet use (when combined, the top 8 metros only accounted for 28.5million Internet users out of the total 88million users from urban areas). Home turned out to be the most favourite access point for Internet users in the country while the use of Cyber CafÃ© saw a major decline. Mobile phones also turned out to be a major contributor this year since 26.3million users accessed the Internet via their mobile phones. Today, most of the telecom operators offer Internet at affordable prices to their customers that are spread across the country. This has also led to the increase in the use of Internet via mobile phones. Although Internet usage among the middle aged men and women continue to show stability, the younger generation completely dominates the usage of Internet in India. More than 75 per cent of the Internet usage is driven by youngsters that include young men (27per cent) and school (21per cent) and college (27per cent) going students. On the other hand, older men and working and non-working women account for only 25 per cent of the total Internet usage in India. Also, although all three categories of youngsters are prominent, the number of school going kids that use the Internet today has been increasing substantially in the recent time. IAMAI believes that this is majorly due to the now existent e-learning services and education information available on the Internet. 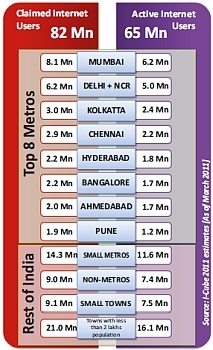 In the 30 urban cities where the survey was conducted, 89 per cent used the Internet to access e-mails, 71 per cent used it for social networking activities, 64 per cent accessed it to search for education-related content while 55 per cent used it for chatting purposes and 49 per cent used it for accessing music, videos and images. The usage pattern in the rural areas differed a lot from the urban areas. Among the 7 surveyed states, 46 per cent used the Internet for accessing music, videos and images, 38 per cent for e-mail and communication activities, 29 per cent for getting general information and finally 27 per cent used the Internet for accessing content related to education. Additionally, the frequency of use was also healthy since out of the 79million active Internet users, 87 per cent of users used the Internet at least once a week.